In the winter time, I’m a huge fan of stew. There’s just something so cozy about starting a stew and letting it braise. It puts me in a good mood every time. I think it has something to do with the fact that your whole house fills up with delicious smells, making the anticipation unbearable in the best way possible. Braising and stewing is incredibly easy: all you need to do is sear some meat and aromatics, cover with a bit of water or stock, and then let the whole thing cook down low and slow. Braises and stews are excellent for those cuts of meat that have a lot of connective tissue – for beef, chuck, brisket, round are some good choices. For pork, shoulder is super popular, or belly works well too. 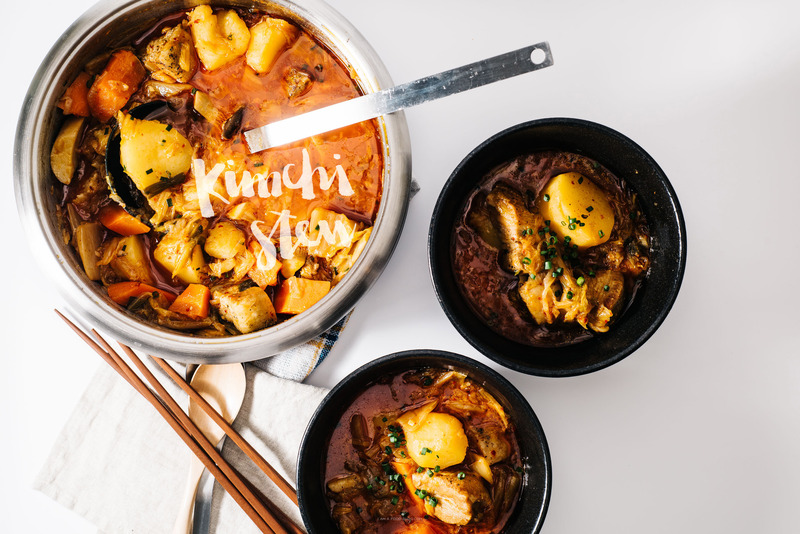 Combine tender, succulent meat with spicy kimchi and you’ve got yourself a stew that’ll definitely warm you up. I’ve got to admit, the first time I tried kimchi, I didn’t like it. It was sour, slimy and just too much for my unrefined palette. It probably didn’t help that when I tried it, it was literally just a piece of napa cabbage kimchi. I mean, that was it: I took a piece of kimchi and ate it. It wasn’t a garnish, or part of a dish. There was nothing to alter the unabashed kimchi-ness of it. I practically wanted to spit it out – I didn’t, but it wasn’t something that I wanted to eat again. It was only after I cooked my way through the Momofuku cookbook that I learned to love kimchi. 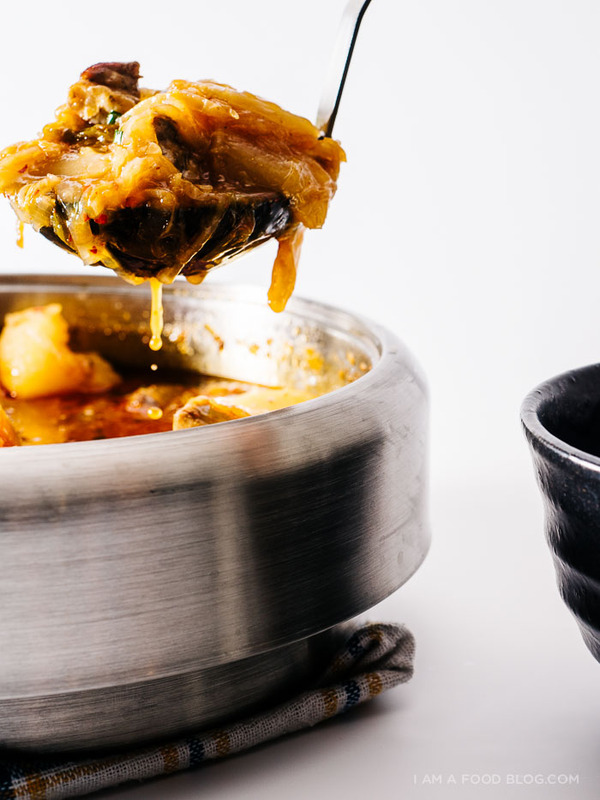 The one dish that convinced me was kimchi stew. See, something magical happens when you cook kimchi: it mellows out into a milder version, turning into an addictive, slightly spicy, slightly crunchy, yet soft creamy crunchy pile of addictiveness. If you’re still not a lover of kimchi, do yourself a favor and lightly pan fry some in butter and tuck it into a tortilla with cheese to make a kimchi quesadilla – it’s seriously one of my favorite things to eat. 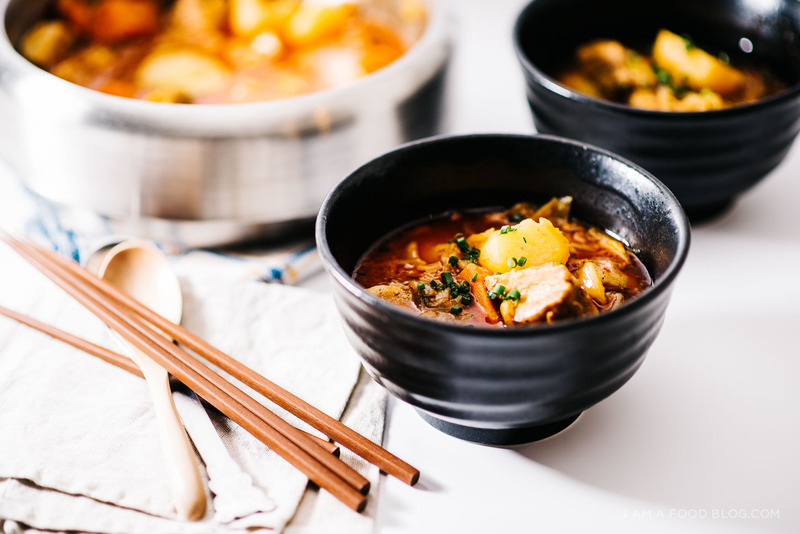 Kimchi stew is one of those beloved dishes. 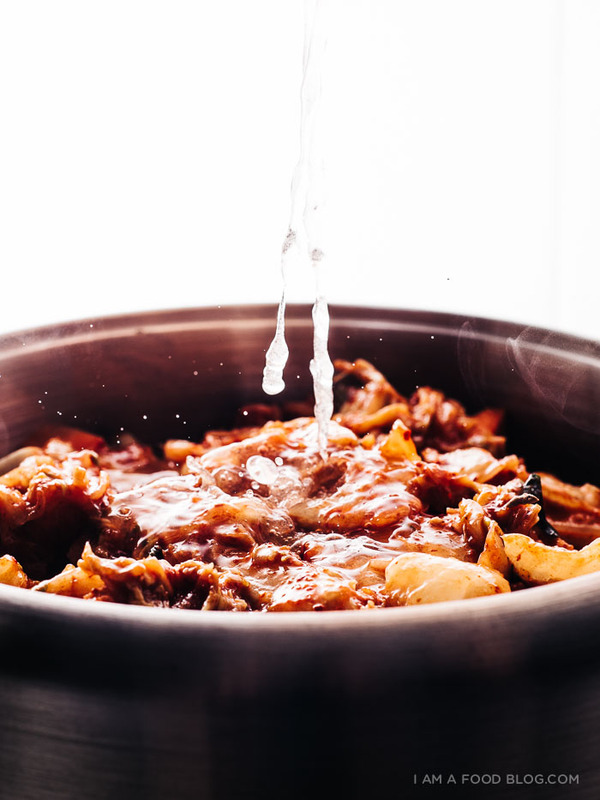 All Koreans have their own recipes for kimchi jigae – it’s as homestyle dish that has as many variations as types of pizza. I did this as a mix of a traditional kimchi jigae and a good ol’ regular stew. Kimchi jigae is usually made with thinly sliced pork belly, but I went with thick slab belly to take it over the top. Along with the belly and kimchi, I also added in the usual suspects in any regular homestyle stew: onions, carrots and potatoes. This was one of those meals Mike and I couldn’t get enough of. We ate until we were stuffed and the next day, even though we were planning on going out for dinner, we voted to stay in to polish off the leftovers. It’s a winner! 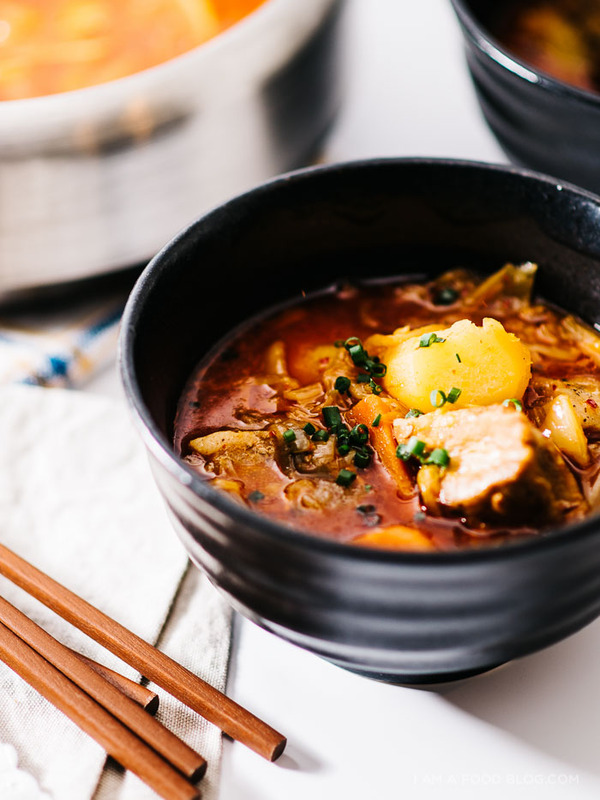 Hope you guys get a chance to give this pork belly kimchi stew recipe a go! Slice the belly into 1-inch thick cubes. Season all sides with a generous sprinkle of salt and freshly ground pepper. Heat up a heavy-bottomed, oven-proof dutch oven or pot over medium-high heat. Sear all sides of the belly until golden and brown. 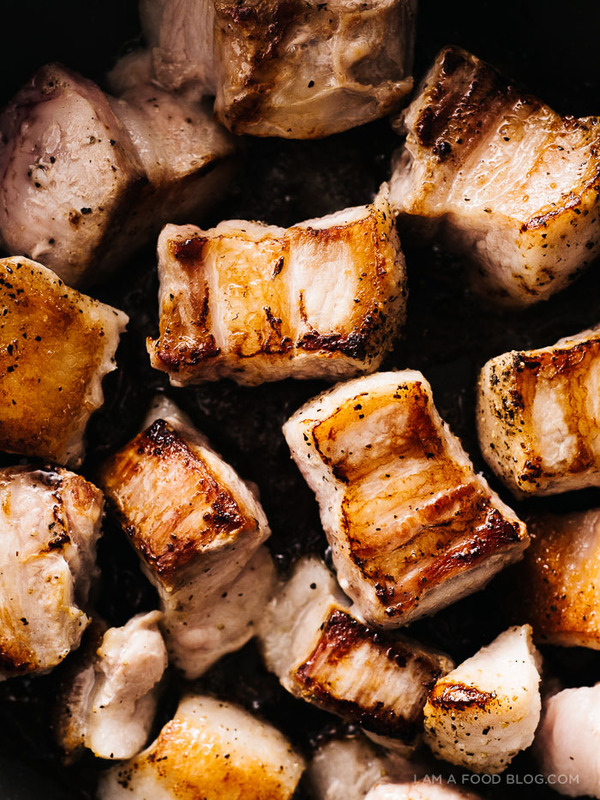 You shouldn’t need any additional oil as pork belly has a high fat content – if you experience sticking, or are nervous about your pork sticking to your pan, add a touch of oil, but you really should need much at all. When the pork is golden, Remove from the pan and set aside. If a lot of fat has rendered out, remove all but 1 tablespoon. 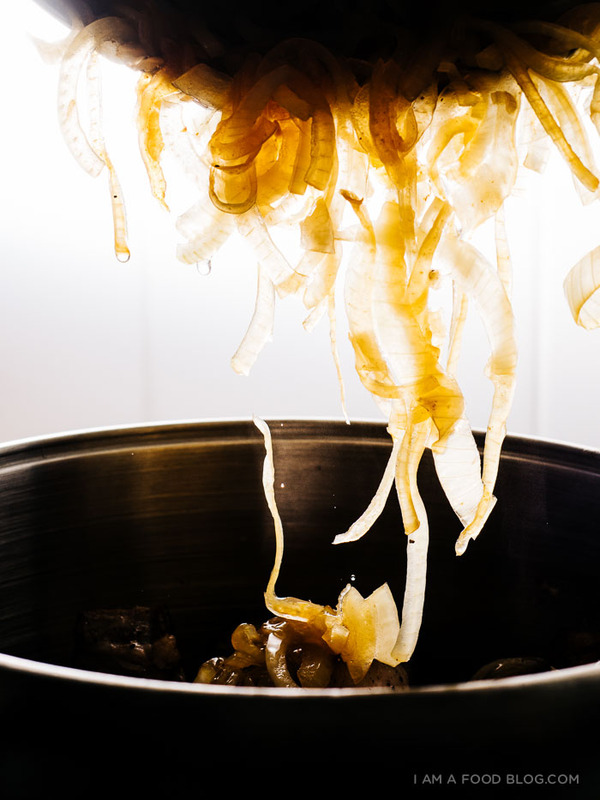 Add the sliced onions and cook over medium heat until brown and soft. Add the kimchi, carrots (and mushrooms, if using) and brown lightly. Add the pork back into the pot and mix well. Add just enough water to barely cover the pork and bring to a gentle simmer. Keep the stew, covered, at a barely bubbling simmer for an hour. After an hour, stir in the potatoes. Cover and continue to cook for another hour. After 2 hours the pork should be incredibly tender. Taste and add the mirin, adjusting if necessary. Season with salt and pepper if needed and serve, sprinkled with a generous amount of green onions for a bit of freshness. Enjoy on it’s own, or with your favorite grain, pasta, noodles, or bread. When you’re buying your pork belly slab, look for a piece that has a decent fat to meat ratio. I like my belly on the leaner side – most bellies have a lot of fat, so be conscious while selecting your meat. I find that store bought kimchi works just fine in stew. 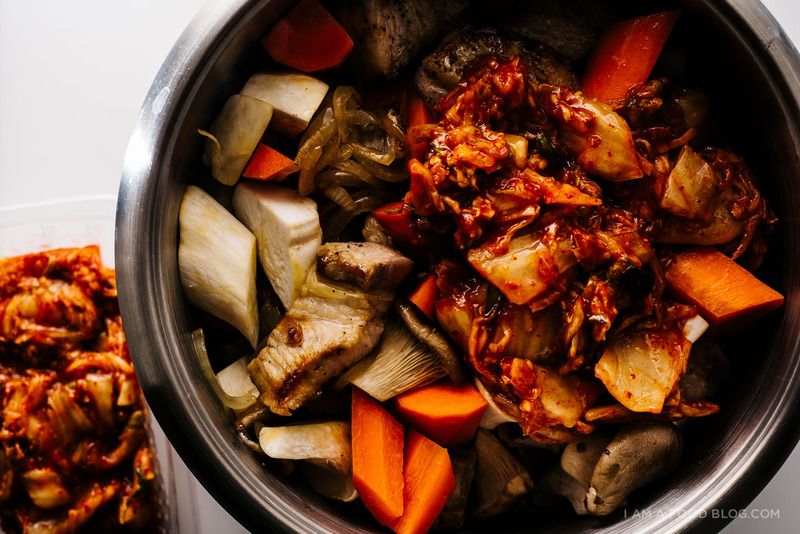 You can find kimchi in the refrigerated section of the grocery store, usually near the tofu. 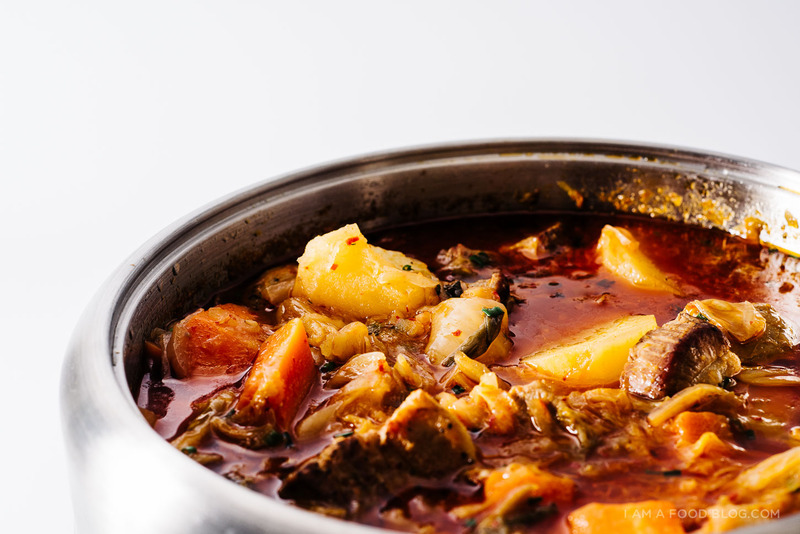 If you’re more comfortable finishing your stew in the oven, please do! Just place the covered pot in a 325°F oven for an hour, remove and stir in the potatoes, and place in the oven for another hour. Don’t forget to check out the Samsung Club des Chefs videos! You can win a new Samsung fridge if you upload a photo or video inspired by the tips – just post your creation on Instagram and be sure to tag @samsunghomeappliances and #chefsecrets to enter. Good luck! I just made the Lady and Pups vampire slayer ramen that starts with a braised pork belly, and it seriously is one of the most glorious ingredients to work with (https://girlnamedallyn.wordpress.com/2015/01/01/vampire-slayer-ramen/). I’ve made a kimchi jigae before that I wasn’t overly impressed with, but I think your pork belly addition might help solve that problem. Might even sub in some dried shiitakes as well. Can’t wait to try this! Also, kimchi grilled cheese, forever and ever amen. Ahhh! You and I have the exact same thoughts on kimchi — big fan of it when cooked/added to things, but I am not a fan of it raw. I’m always embarrassed to admit that though! I could really go for this on such a cold day right now!! This looks like insane comfort to me!! So tasty Stephanie! Heaven in a pot. Moses is the biggest fan of kimchi. We had a huge vat of it in the car on our drive up to Big Bear and even with the bottle totally sealed, the car still reeked of it. He loved it…me…I tolerated it. Don’t get me wrong–I’m a huge fan of the stuff. But I digress. I am so excited about this and have a feeling I know what I’m cooking up before I leave Moses for a week (and fly to Hawaii, while he’s stuck out here)!! Ahhh! I love kimchi and I love stew. I’m giving this a go this weekend for sure! There is magic in this soup, I’m almost sure of it. Pure comfort food is an understatement, really. I’m stuck in the middle of a blizzard at the moment, and just looking at your gorgeous photos makes me warmer. So good! This is so good that I can’t wait to make it again. Comforting without being heavy, the pork belly is savory but didn’t weigh the dish down, surprisingly. The kimchi mellowed as it cooked as promised and provided a nice back note. Simple to make, this soup is a winner. Thanks for this recipe. 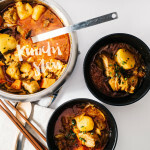 I never really thought of adding Kim chi to a stew because I’ve always thought of it as a condiment only, but it is sort of a one pack punch of flavor, isn’t it? Can’t wait to try it, thanks! I am half Korean and have grown up eating this. It’s one of my favorite dishes my mother makes. No one can make it better than mom can. She does many different renditions of this stew, but my favorite is with pork loin. She also makes a killer one with chicken thighs. I love your blog and I will be back every chance I get. Thank you for sharing. It brings nostalgic feelings of home. I made this tonight and it is both delicious and super easy to make. I even forgot to add the mirin and it was still delicious. The only downside is that it is so tasty that the leftover situation is grim. This was so delicious, I made it last night and poured some over rice. Question though – how did you get yours to be sooo deliciously red? 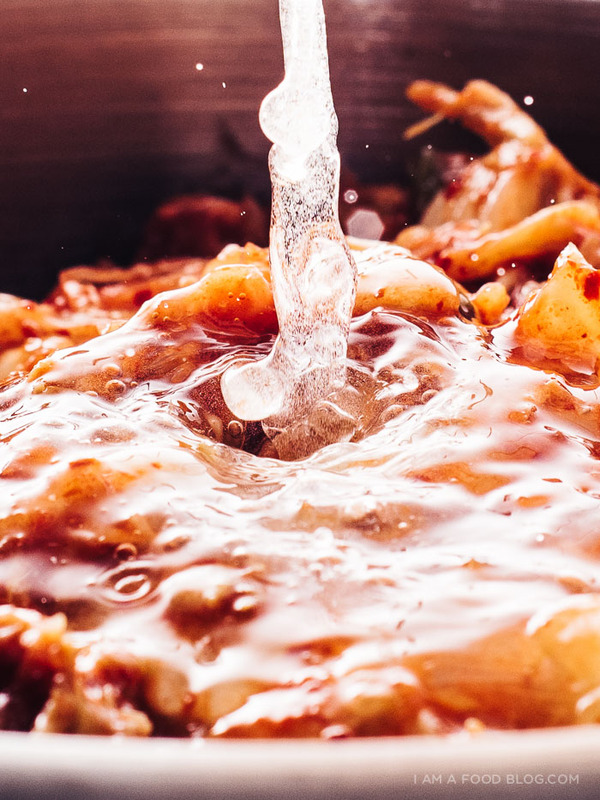 Does it have to do with the type of kimchi you use? I’m wondering if adding a bit of chili oil will help. yay!!! so happy you made it! the redness definitely has to do with the kimchi you use. some kimchi is just way more bright than others, especially if you’re using fresher vs extra fermented kimchi. if you like spicy stuff and want to up the colour, add in some kochukaru (korean chili powder), which is where kimchi gets it’s spice. chili oil would work too of course! If you find yourself in New York, you should try the kimchi bouillabaisse at Bistro Petit in Williamsburg! This looks very yummy, definitely I’ll try this . Pork stew sounds awesome……Anyways will make a try on the same and let you know the result of the same. I love seeing another great kimchi recipe! I tend to buy small jars of kimchi from my local Korean store. Anything bigger saturates the other food with the smell of kimchi in my fridge.